Guilhermina Suggia (1885 – 1950) was a Portuguese cellist of international renown. She studied with some of the best cellist and musicians of the time, and her legacy has helped many young cellists, myself included. But before even speaking about her life, we need to put it into some context. In the nineteenth century few were the women who played instruments professionally. There were pianists, violinists, flutists, that either played solo or with an orchestra. But cellists? Oh no. The cello was seen as a very masculine instrument, and some people found it was very improper for a lady to play an instrument in such a position. Futhermore, the cello really isn’t the easiest instrument to play while wearing a dress, since you would have to hold it in place with both legs (and I speak from experience). She was lucky enough to grow up in a very favourable environment. Her father, also a cellist, was always very supportive of Guilhermina and her sister, a pianist, and Oporto had many opportunities for musicians. At the turn of the millennium, the city was home to an energetic community of classical musicians. 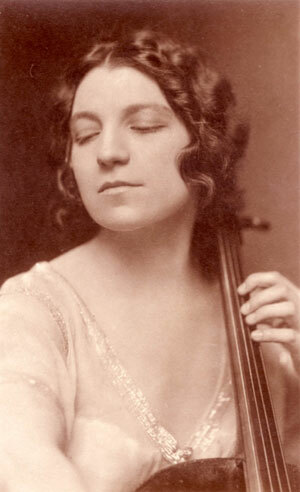 Guilhermina was one of the pioneers in turning the cello into an acceptable instrument for women. Her father taught her how to play when she was only five years old. She became the main cellist in Oporto’s orchestra at thirteen. Two years later, and with the support of the Portuguese Queen, she left the country to go study with Julius Klengel in Germany. In 1903, only 17 years of age, she played as a soloist with the Gewandhaus Orchestra, one of the best German orchestras. Never had someone so young played with them before, and surely not a woman. Unfortunately, even with the support of Queen Maria Amelia, living in Germany was too expensive for her. After that famous concert, she went back to Portugal, where she was welcomed as a star. By that time she had the attention of many great musicians, and she was fortunate enough to become a student of Pablo Casals, considered to be the best cellist of the first half of the century. She lived with Pablo Casals many years, as a student and as his lover. Their romantic affair was famous and they even had a concert for two cellos dedicated to them by the composer Emánuel Moór. However, in 1913 the affair came to an end and they parted ways. It was after that that she moved to London, and where she created the greatest part of what would become her legacy. She played with the best orchestras and received the best acclaimed critiques. After she died, she left two of her cellos to the Royal Academy of Music in London, and with that money they created The Suggia Gift, a scholarship that would help many young cellists (for example Jacqueline du Pré, another female cellist). In 1930s she decided to go back home, to Portugal. After some years she stopped playing in public, but never stopped supporting the growth of music in her country. She came back for a final concert in 1950, but died soon afterwards. She was an inspiration to many female musicians, and she always defended that women could do the same things men could. It was her, actually, that introduced the common use of the end pin in cellos, so it would be easier for women to play with a dress. Guilhermina made a place in History for herself, and her influence is still seen today. I leave you with one of the few recordings left of this wonderful musician playing. As always, if you have any questions, feel free to ask them. So beautiful. I always loved the cello, but the viola caught me before I tried it. Thank you for the lovely post and especially the music. What a lovely share! The tone of a cello is so like a voice. And her expertise shines so beautifully in this selection. What an interesting person she was as well. I don’t play any instrument, but I love to listen to violins, violas and cellos, and loved Pablo Casals’ playing.